1) Quoted in “The Engagement and Disengagement of U.S. Forces From Crises; As the Marines in Beirut Escalate Firepower, Fears Grow That They Are in a Quagmire,” Washington Post , 9 September 1983. 2) Agreement Between the United States and Lebanon , 25 September 1982, quoted in Kelly (1996: 5); Frank (1987: 22, 24, 38-9); Malone, Miller, and Robben (1985: 11); “Next Steps in Lebanon ,” National Security Decision Directive No. 64, 28 October 1982, Federation of American Scientists (2003). 3) Malone, Miller, and Robben (1985: 11, 19); “Strategy for Lebanon ,” National Security Decision Directive 103, 10 September 1983, and Addendum, 11 September 1983, Federation of American Scientists (2003); “Reagan Says Offshore Force is ‘a Marker for the Syrians,'” Washington Post , 5 September 1983; “Fighting in Lebanon : Balance of Forces,” New York Times , 9 September 1983. 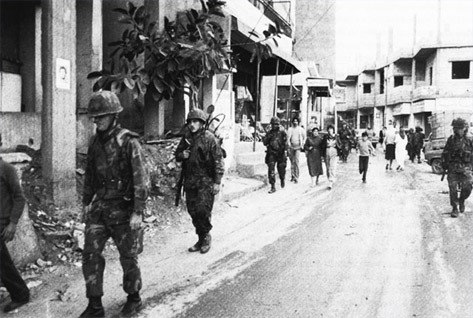 It is worth noting that the U.S. special envoy to Lebanon pushed for U.S. air and naval support of the LAF on that grounds that otherwise there would be “a serious threat of a decisive military defeat which could involve the fall of the Government of Lebanon within twenty-four hours.” This situation description was not agreed with in Washington , where the Secretary of Defense described it as a “‘sky is falling' cable” (Kelly 1996: 6).